Whether you’re an investor or an end-user, buying a condominium during the pre-construction stage can have several advantages. For one thing, if you’re prepared to wait the average two or three years for the building to be finished, you will own the newest building on the block. That brings the peace of mind knowing that you’ll have the lowest maintenance fees and highest reliability. Buying pre-construction can also save you 5% or more on the purchase price, by the time the project is complete. One of the biggest advantages of a pre-construction purchase is that you’re splitting up the down payment. It allows buyers to save cash flow, by spacing out the deposit. You’re basically hedging your bets on future value and potential. 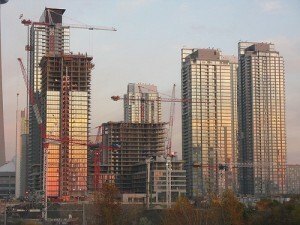 The demand for rental units in Toronto is very high, which is fulfilled almost entirely by new condo units. For investors, financial returns can be realized by buying, waiting and selling upon completion.